DENTRIX is the world’s best-selling practice management software. Offering unequaled customer-service and awesome electronic services, DENTRIX brings technology to your practice in a simple, easy-to-use approach. Fully integrated modules share information as needed, making data entry simple…and quick! Eliminate multiple entries with intuitive, easy to navigate screens. Fewer clicks to accomplish tasks, saves you time. Improve your production and collections by using the built-in tools such as Unscheduled Treatment Plans, Treatment Manager, Collections Manager, and ASAP and Unscheduled Lists. Keep your fingers on the pulse of your practice with our Practice Analysis Reports, Aging Reports, Production Reports, etc. All these (and more!) available with only a few clicks! When integrated with our award-winning DENTRIX Image Management Software, you have a complete practice automation system. Fully integrated with the DENTRIX Practice Management System, Dentrix image management software allows you to capture, store and organize all your images. 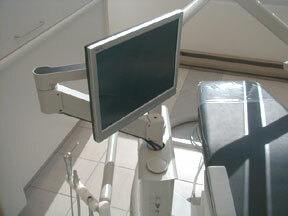 Improve your case acceptance through the use of intraoral cameras. Apply notations to create “impact” in your pictures. Digital x-rays bring tremendous advantages – not just to your patients through the reduction in radiation exposure, but to your practice through the ability to view captured images – almost instantly! Improve your efficiency by using your time treating patients – not waiting on your x-rays to be developed! Eliminate chemicals by removing that processor! Sharpen your professional image with the latest in digital technology, but don’t be limited by your choice. DENTRIX Image truly integrates not only with our own award-winning sensors and intraoral cameras, but also with most of today’s leading sensors and phosphor-based systems. Electronic Services for DENTRIX is your solution to creating an automated, paperless dental office. Using the latest technology to communicate with payors, patients and other businesses, eServices will cut your operational and material costs. Your staff will be able to devote their time and energy to serving patients, and increasing your patient base. PowerPay Automate your credit card processing, including powerful reminders such as monthly credit card billing, payment plans, etc.